During the Spanish Civil War of 1936-1939, the Luftwaffe discovered that the only really effective way to deliver bombs on to a point target was in a near-vertical dive. This procedure they repeated in 1939 in Poland and in 1940 in the Low Countries and France. Over Britain, later in the year, the Luftwaffe came across the basic flaw in this principle: dive bombers were uncomfortably vulnerable to effective fighter aircraft and concentrated anti-aircraft artillery. As an alternative, there was always area bombing from high altitude, but it was very wasteful and of little use against isolated high-value targets. Warships at sea were particularly difficult to hit, and the Luftwaffe frequently found itself mounting costly raids on important maritime targets which achieved little or nothing. Quite early on, thoughts turned to the development of a bomb which could be guided in flight. Ruhrstahl's X-4 air-to-air missile showed promise, but it never lived up to it. Much more useful was the guided bomb they produced as the X-1. It had a plethora of names: the RLM called it the PC 1400X; the Luftwaffe called it the 'Fritz-X'; and it has also been referred to as the FX 1400 and simply as the FX. However, its success was short-lived, despite having been designed with cheapness and simplicity in mind. 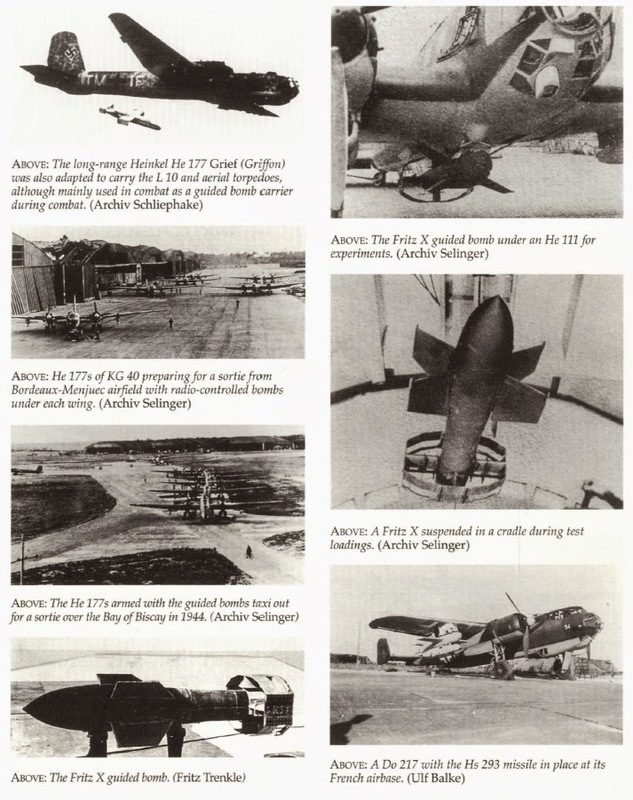 It had as its starting point the Luftwaffe's standard 1400kg (3080lb) bomb, either the cast-steel thick cased SD (Sprengbombe Dickwandig) 1400 known as 'Fritz', or the forged-steel armour-piercing variant, the PC (Panzersprengbombe Cylindrisch) 1400. The original bomb, manufactured by Rheinmetall-Borsig, of perfectly conventional shape, was a plain cylinder with a rounded nose coming to a blunt point and a conical tail with four sheet-metal fins partially shrouded by a strengthening ring at the extremity. Ruhrstahl modified the overall form somewhat for its guided bomb, leaving the last part of the cylinder intact but introducing an oversize ogival form to the first two-thirds of its length. In order to maximise its aerodynamic performance, they gave it four relatively large fins, located forward of the mid-point of the bomb's length, with square leading edges and a pronounced sweep to the trailing edges. These main fins were mounted asymmetrically, as if they formed the diagonals of a rectangle with sides in the ratio one-and-a-half to one. The 12-sided framework which replaced the simple fin-and-shroud empennage maintained that same basic rectangular form, but with the corners cut off. Within it were four smaller fins, set vertically and horizontally and containing the spoilers themselves, simple tabs which were actuated by electro-magnets and which caused disturbance within the airflow over the appropriate surface of the fin when they were deployed. Deployment in turn caused the whole bomb to alter course or angle of descent by swinging it around the axis formed by the straight leading edge of the main fins. Guidance was by means of a radio link using the Kehl/Strassburg system (but later, the wire-link control system was adapted for use with the X-1 too), while flares, or battery-powered lamps on the tail for use at night, helped the operator to keep track of the missile in flight. It was a simple, fairly ingenious system, and it worked well enough, so long as the bomb was dropped from sufficient height. Released at the minimum altitude of 4000m (13,125ft) it had a range of up to 4.5km (2.8 miles); dropped from the maximum height any of its carrying aircraft could attain of 8000m (26,250ft), the range was up to 9km (5.6 miles). It was capable of piercing 130mm (5.125 in) of armour plate when dropped from 6000m (19,700ft). Though it is often referred to as a glider bomb, that is not actually the case. Its forward speed was that imparted by the launching aircraft, and it certainly did not 'fly' in any accepted sense. Its only major vector was downwards, and all the spoilers could do was modify its path to a small degree. That was often enough to make the difference between success and failure, as we shall see later when we look at operational deployment of the ASMs. A total of 1386 X-1s were produced between April 1943 and December 1944, when manufacturing ceased, and this was far short of the planned figure of 750 per month. Less than half of them - a total of 602 - were expended, in testing, training and operations. The Ruhrstahl X-1 development programme began at around the same time that Wagner's team at Henschel began work on the Hs 293. Surprisingly, development took longer, but it proved to be much simpler to train aircrew to 'fly' the bomb than the missile, and the two were eventually deployed together. Initially, the RLM had tried to persuade Henschel to produce a missile which levelled out just above the water some distance before reaching the target, and another which would actually submerge and act like a conventional torpedo, but the company refused on the grounds that such a course would be too ambitious, since there was no experience on which to draw. Instead, it put forward the concept of a straightforward guided glider bomb, unpowered but with aerodynamic properties, and the RLM agreed. The first experimental version, with no warhead, was tested in the spring of 1940, and by the end of the year a variant with a rocket motor, which allowed launch at 400m (1315ft) instead of the 1000m (3280ft) previously required, had been flown successfully, and plans for a production version of the latter were going ahead. The Hs 293A-1 was built up from the nose and body sections of an SC (Sprengbombe Cylindrisch) 500 thin-walled bomb, with an elongated rear section tapering in the vertical plane, which extended above and below the body unequally to form small dorsal and larger ventral fins, carrying the guidance system. Short symmetrical wings with conventional ailerons were mounted where the bomb and tail section joined, and a tailplane with an equally conventional elevator was mounted just above their plane, where it would operate in clear air. The ailerons were actuated by electromagnets; the elevator by an electric motor and worm screw. The rocket motor - a liquid-propellant Walter 109-507B, using T-Stoff and Z-Stoff held in pressurised tanks - was underslung beneath the fuselage in a pod; it gave only 600kg (1300lb) of thrust for 10 seconds, but that was enough to propel the missile well ahead of the aircraft to a point where the bomb aimer could see it. This had been a recurring problem with the X-1, and one which could only be solved by the pilot of the launch aircraft throttling back and lowering his flaps until the aircraft almost stalled, which made him very vulnerable indeed. 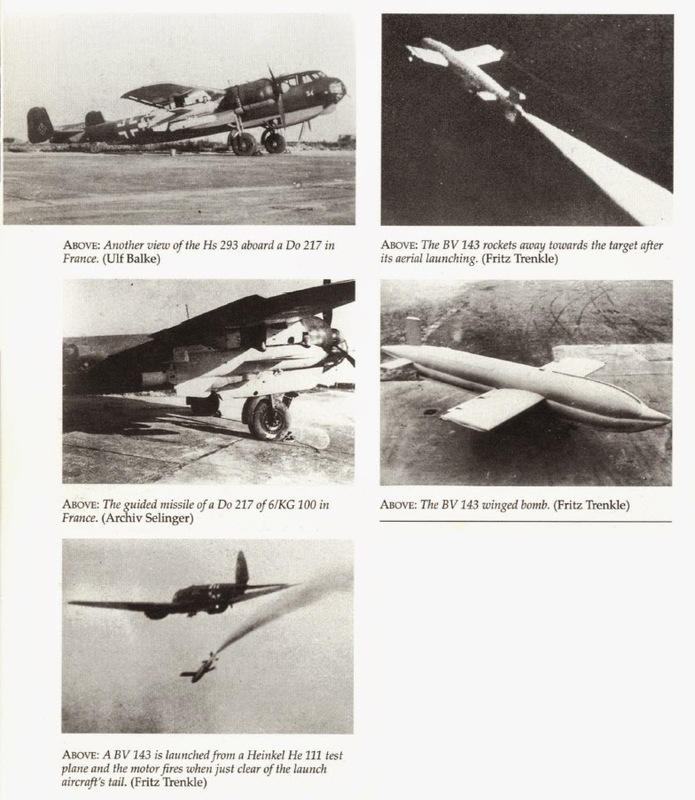 The flight profile of the Hs 293 was quite different from that of the X-1. It was normally released at between 400m (1315ft) and 2000m (6560ft), and between 3.5km (2.2 miles) and 18km (11 miles) short of the target. The terminal velocity varied between 435km/h (270mph) and 900km/h (560mph) depending on the altitude from which it had been released. Control, as always, was by joystick and radio link, on the Kehl/Strassburg system, but wire linkage was soon proposed and implemented, this time using a duplex bobbin system, with the wire being paid out from aircraft and missile simultaneously, giving a maximum range of 30km (18.7 miles). As with the X- 1, flares in the tail - which were exchanged for small battery-powered lamps for night operations - allowed the bomb-aimer to keep track of the missile in flight. A version of the basic weapon, with an extended nose to contain a television camera, was developed as the Hs 293D. The television equipment was developed by Fernseh GmbH in collaboration with the Reichspost-Forschungsanstalt. It was a vertical rasterscan 224-line system operating at 50Hz. Under ideal (laboratory) conditions, with its inventors to operate it, the system worked adequately enough, but under operational conditions it was much less successful and was finally abandoned. Such technology was not yet fully understood, and it was to be many years before it was perfected in weapons such as the American AGM-65 'Maverick' and the Anglo-French 'Martel' of the 1980s. Other Hs 293 variants included the Hs 293H, which was discussed above in the context of air-to-air missiles, and the delta-winged, tailless (and stillborn) Hs 293F. It is unclear how many Hs 293s of all types were manufactured, but educated guesses put the number at perhaps 1500, many of which were expended in the long testing and training programme. Blohm & Voss reacted to the RLM's requirement for a sea-skimming missile with a proposal for a guided glider bomb. This incorporated a rocket motor which was only ignited by tripping a 2m- (6.5ft-) long lever hanging from its underside when the bomb came to the end of its descent. It was an ingenious solution, but proved to be unworkable. The length of time available to initiate the rocket motor was just insufficient, and the prototypes simply ploughed into the sea. Rather better conceived was the Bv 246 'Hagelkorn' ('Hailstone'), which was a pure glider and was intended specifically to attack radio stations transmitting navigational signals to RAF bombers by homing in on their very signals. The Bv 246 was a simple aerodynamic shape with a cruciform empennage incorporating a vertical control surface, and high aspect-ratio wings designed to give it a shallow glide angle (1:25, or barely 4 degrees) and thus a long range after launch. Released at 10,500m (34,450ft), it had a range of 210km (130 miles). The original proposal was made in 1942, but there was little official interest despite the fact that the RAF had already begun to use radio as a navigational aid. It was December 1943 before 'Hagelkorn' was ordered into production and it was cancelled two months later in the February 1944 austerity drive, by which time hundreds had been built. These missiles were gradually expended in a protracted low-priority test programme which lasted until January 1945. With an all-up weight of 730kg (1600lb), of which 435kg (960lb) was warhead, it was light enough to be deployed by an Fw 190. The RLM did not give up its search for an air-to-subsurface weapon, and Henschel responded eventually with a variety of designs for what we may regard as guided air-launched torpedoes. The simplest of these was a version of the Hs 293, and from that, in 1943, sprang the larger and more powerful Hs 294, intended to be used to attack armoured ships. Two versions were produced in prototype form, one with radio guidance, the other with a wire command link. The Hs 294 was essentially of the same form as the air-to-surface missile, with the addition of a long, tapered nose cone and a second rocket unit. It was to be flown into the sea at a shallow angle (optimum 22 degrees); the wings and the rear fuselage were mounted so that they would break away on hitting the water, and the warhead, with its 656kg (1445lb) explosive charge, would then be free to travel in a parabolic path, induced by the form of its upper surface, for up to 45m (150ft), self-destructing if it had not found its target. It is believed that a total of around 1450 were ordered, but few were produced. The Hs 294 was followed by a rather more ambitious project known as the GT 1200, which certainly did not get past the prototype stage. GT 1200 was to have been an unpowered glider, with the guidance package of the Hs 293, but without a rocket motor to assist its launch. Instead, the rocket motor, a standard Schmidding solid-fuel unit, was to have been used only during the last phase of its deployment, underwater, when, shorn of its wings and 'fuselage' extension, it became an otherwise conventional torpedo, steered by small rudders on its cruciform rear-mounted fins. There is no indication of how the missile was to have been guided during its run through the water. Hensehel's last foray into the field of air-launched submarine weapons was to have been a supersonic missile known as the 'Zitterrochen' (Torpedo Fish'), its triangular planform wings incorporating 'Wagner bars' - simply spoilers moved to the wing trailing edge - instead of ailerons. The project never got off the ground, but the control system found its way into the Hs 117 'Schmetterling' and the Hs 298.